murdered by agents of the British State back in 1993. The same violent policy of collusion was in place when the club’s senior football manager, Gerry Devlin, was murdered in 1997. It is also strongly believed that paid Special Branch PSNI agents killed the club’s young footballer, Gerard Lawlor in 2002, one year after the Gaelic Athletic Association surrendered to the merciless realpolitik of the Peace Process and permitted membership to the same ‘security forces’. In the eyes of St Enda’s community, these brave Gaels were murdered because they had the courage to publicly announce a separate Gaelic culture and identity is this neo-colonial sectarian state we reside in. The Gaels of this club are proud of the fact that they were founded on the fortieth anniversary of the Easter Rising in 1956. They took inspiration from the revolution of Pádraig Pearse and the clear understanding that the cultural revivalist struggle was central to the wider political struggle for the Reconquest of Ireland from colonial rule. The contemporary descendants of these Gaels went one step further in 2004 when they founded Gaelscoil Éanna, that has now become the fastest growing Gaelscoil on the island of Ireland. They believe in Pearse’s philosophy that the language should be reclaimed as a decolonising tool to fight back against the British ‘murder machine’ and inspire self-empowerment, self-respect and self-confidence in the Irish people. Therefore, it’s in ‘in no spirit of timid apology’ that the Gaels of the club promote St Enda’s as a republican project rooted in the Proclamation of Easter 1916. It takes only a cursory glance at the founding history of the GAA to understand that the Gaels of St Enda’s are loyal to these worthy values. The association was the first step in a process of decolonisation, an attempt to reclaim all that was being lost by British colonisation at the end of the nineteenth century. By 1890, there were 1000 clubs in parishes throughout the country, thus rendering the GAA the fastest growing sporting organisation in the world. People followed because they understood that they weren’t barbarians who had been transformed into loyal British subjects. People followed because they thought their native culture worthy of reclamation in the quest to build an independent identity. Conversely, the recent media narrative reveals that the revision of history and cultural assimilation are at the top of the agenda while our association’s rich heritage lies on the ‘dissecting’ table. The Peace Process in the north opened the space for the rhetoric of ‘reconciliation’ which imposed the logic of co-option on our independent association, thus encouraging the leadership of the GAA to believe that they would have to abandon our proud history in order to survive in the modern world. As the anti-colonial theorist, Alberto Memmi, put it ‘in order to free himself, or so he believes, the colonised agrees to destroy himself’. Therefore, it was ‘progressive’ in 2001, to allow British Armed forces to participate in our games, despite the fact that undemocratic partition remained consolidated; that our members were still being murdered by agents of the same forces; and that this powerful empire are continuing with the same oppressive colonial policies across the globe. Ireland’ as a ‘normal’ place. We were ‘grown up’ enough to recognise that partition was ‘worthwhile’ and ‘stable’ lest anyone dare to challenge it in the future. We were ‘non-political’ enough to recognise that the British Government are ‘neutral brokers’ in the conflict between two sectarian tribes in the ‘two peaceful nations’ in Ireland. We were ‘open’ enough to buy in to the ‘carve-up’ between ‘orange and green’ as we ‘built bridges’ with the Orange Order as if there was some equivalence between us and an openly sectarian organisation which was founded to deny equality to Catholics and Presbyterians whilst consolidating the supremacist mentality within the unionist community. It was because of the ‘great progress’ that emanated from this conflict resolution approach of the new dispensation that we received high praise from our neo-colonial Prime-Minister, Peter Robinson. The victims of colonization barely had enough time to fall over each other in welcoming this ‘kind’ praise, when an extremist colleague of his, Gregory Campbell, stated that these ‘progressive’ policies didn’t go far enough, and that a re-writing and re-naming was required to complete the ‘journey’. It became clear that cultural colonisation and the assimilative logic of the peace process won’t tolerate half-measures. As the Algerian revolutionary stated, ‘colonialism is not satisfied merely with holding a people in its grip and emptying the native’s brain of all form and content.…it turns to the past of the oppressed people, and distorts, disfigures and destroys it’. On the other hand, the achievements of St Enda’s Gaels prove that not every activist agrees with this journey of co-option, and thus the diktats of the New Northern Ireland won’t be taken lying down. The founding spirit of our association is clearly alive and well amongst ordinary local Gaelic communities, especially in places like Dungiven, where a club was named in honour of a brave Gael, not only because of Kevin Lynch’s exploits on the hurling field, but because he refused to bow the knee to the coloniser and stood his ground to the end, in steadfast opposition to contemporary British Imperialism in Ireland. Rinne mé machnamh ar eiteos agus oidhreacht shaibhir Cumann Luthchléas Gaeil agus mé ag déanamh seoladh leabhair i gCumann Naomh Éanna i nGleann Ghorm Liath ar an satharn seo caite. Onóir mhór a bhí ann dom seo a dhéanamh mar chuid do chuimhneachán fiche bliana Seán Fox, a bhí uachtarán ar an chumann nuair a mháraigh gníomhairí stát na Breataine é thiar in 1993. Is an polasaí foréigneach na claonpháirtíochta céanna a bhí in úsáid nuair a dunmharaíodh bainisteoir peile sinsir an chumainn, Gerry Devlin in 1997. Creidtear go láidir fosta gur mharaigh gníomhairí rúnda ó Bhrainse Spéisialta an PSNI an peiladóir óg, Gerard Lawlor in 2002, bliain ina dhiaidh do Chumann Luthchleas Gaeil géilleadh do realpolitick neamhthrócaireach an próiseas síochana agus iad ag céadú ballraíocht do na forsaí ‘slándála’ céanna. Feictear do mhuintir Naomh Éanna gur maraíodh na Gaeil cróga seo mar go raibh sé de uchtach acu fogairt go poiblí go raibh cultúir agus féiniúlacht Ghaelach acu sa stáitín nua-choilíneach seichteach ina mhairimid. Tá Gaeil an chumainn seo bródúil gur bunaíodh iad ar comóradh daichead bliana Éirí Amach na Cásca in 1956. Ghlac siad spreagadh ó réabhlóid Phadraig Mhic Phiarais agus an tuiscint shoiléir gur dlúthchuid í an streachailt athbheochana cultúrtha don mhórstreachailt pholaitiúil chun Éirinn a athghabháil ón smacht choilíneach. Chuaigh sliochtach comhaimseartha na nGaeil seo céim bréise chun tosaigh in 2004 nuair a bhunaigh siad Gaelscoil Éanna atá anois ar an scoil is gaiste fás in Éirinn. Creideann siad i bhfealsúnacht an Phiarsaigh gur chóir athréimniú an teanga a úsáid mar ghléas díchoilínithe chun troid ar ais in éadan ‘murder machine’ na Breataine agus féinchumhachtú, féinmheas agus féinmhuinín a spreagadh athuair in muintir na hÉireann. Mar sin, is ‘in no spirit of timid apology’ go bhforgraíonn Gaeil an chumainn seo gur tioscadail poblachtánach é Naomh Éanna atá fréamhaithe i bhfógógra na Cásca. Ní gá ach mionstaideár a dhéanamh ar stair bunaithe CLG le tuigbheáil go bhfuil Gaeil Naomh Éanna dílis do na spriocanna uasail seo. An chéad chéim i bpróiseas díchoilínithe a bhí sa Chumann, iarracht chun athghabháil a dhéanamh ar an méid a bhí á chailleadh le coiliniú na Breataine ag deireadh na naoú haoise déaga. Fán bhliain 1890, bhí 1000 cumainn i bparóistí ar fud na tire, rud a chiallaigh gurb é an CLG an eagraíocht spóirt is gaiste fáis i stair an domhain. Lean daoine mar gur thug said nach barbaraigh iad a thiontaigh ina ghéillsinigh dílis briotanacha. Lean daoine mar gur mheas said gurb fhiú cultúr dúchais s’acu a athghabháil agus féiniúlacht neamhspléach a thógáil. Mar sin féin, ní gá ach sracfhéachaint a ghlacadh ar insint sna meáin le déanaí le foghlaim go bhfuil athscríobh na staire agus comhshamhlú cultúrtha i mbarr a réime agus oidhreacht shaibhir an chumainn ar tabla ‘diosctha’ na móruaisle. D’oscail an próiseas síochána ó thuaidh an spás do reitric úr an ‘athmhuintearais’ a bhru loighic an comhshamhlaithe anuas ar chumann neamhpléach s’againn agus thosaigh ceannasaíocht an CLG a chreidbheáil go mbeadh orthu stair bhrodúil s’acu a threigint le maireachtáil sa domhan úr. Mar an deir an teoiricí díchoilínithe, Alberto Memmi, ‘in order to free himself, or so he believes, the colonised agrees to destroy himself’. Bhí sé ‘forásach’ mar sin in 2001, ligint do fhorsaí armtha na Breataine, bheith páirteach i gcluichí s’againn, ainneoin go raibh críochdheilight mídhaonlathach daingnithe; baill s’againn á mharú go fóill ag gníomhairí na bhforsaí céanna, agus an impireacht chumhachtach ag leanúnit an clár géarleanúna céanna ar fud an domhain. Bhí muid ‘neamhpholaitiúil’ go leor le haithaint gur ‘bhroicéirí neodrach’ iad Rialtas na Breataine sa choimhlint idir dhá threibh seicteacha sa ‘dhá náisiún’ síochanta in Éirinn. Bhí muid ‘oscailte’ go leor glacadh leis an ‘carve up’ idir ‘oraiste agus glas’ nuair a thóg muid ‘droichead síochana’ leis an Ord Oraisteach amháil agus go raibh coibhéis eadrainn féin agus eagraíocht sheichteach a bunaíodh chun comhionnanas a cheilt ar Chaitlicigh agus Presibítéirigh agus meon uaisleachta na coilíneachta a dhaingniú sa phobal aontachtach. Is mar gheall ar an ‘dul chun cinn iontach’ seo a d’eascair ó chur chuige reitithe coimhlinte na dispeansáide úire go bhfuair muid ardmholadh ónar príomháire nuachoilíneach, Peadar Mac Roibín. Is ar eigeán go raibh an t-am ag íobairtaigh an coilíneachas titim thairis a chéile le fáiltiú roimh na moltaí ‘cineálta’ seo, nuair a léirigh comhghléacaí ainsctoisceach dá chuid, Greagóir Mac Cathmhaoil, nár leor ár bpolasaithe ‘forasacha’ san am i láthair, agus go mbeidh athscríobh agus ath-ainmniú le déanamh fosta chun an ‘turas’ a chríochnú. Is léir nach nglacann an coilíneachas cultúrtha nó polasaí comhshamhlaithe an próiseas síochana le leathmhiosúir. Mar a dúirt an reábhlóidí Algéireach Frantz Fanon féin, ‘colonialism is not satisfied merely with holding a people in its grip and emptying the native’s brain of all form and content.…it turns to the past of the oppressed people, and distorts, disfigures and destroys it’. Os a choinne sin, léiríonn eachtaí Gaeil Naomh Éanna nach n-aontaíonn gach díograiseoir le turas seo an comhshamhlaithe agus nach nglacfar le dictats an Tuaisceart Éireann nua ina luí. Is léir go bhfuil spiorad bunaithe an eagráis beo beathach i measc na cosmhuintire ag leibheál áitiúil, go háirithe in áiteanna cosúil le Dun Géibhinn inár ainmniú cumann in omós do Ghaeil Chróga, ní amháin mar gheall ar na heachtaí spóirtúla a rinne Caoimhín Ó Loingsigh i bpáirc na hiomána, ach de bhrí gur nár umhlaigh sé riamh roimh Ghall nuair sheas sé an fod go deireadh in éadan impiriúlachas reatha na Breataine in Éirinn. This is a grate article I agree. 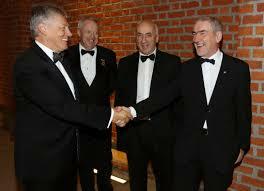 Lets hope there are some in the GAA who can’t be bought and have some integrity left. Hart and co are a disgrace to the Irish Nation. And those who give their lives for Irish freedom. Queen. Make no mistake we will be free and those same grovelling dogs will again try and rewrite what they have been involved in. They should be ashamed of themselves. Ar fheabhas ar fad. Maith thú. Aontaím leat go hiomlán a chara. Alt den scoth.